Manuel Assner is a lecturer and junior researcher at the Latin-American Institute, Freie Universität Berlin, Department of Business and Economics; and a trainer and researcher on migration issues for Network Migration in Europe e.V. He is co-author with Dita Vogel, of Umfang, Entwicklung und Struktur der irregulären Bevölkerung in Deutschland: Expertise im Auftrag der deutschen nationalen Kontaktstelle des Europäischen Migrationsnetzwerks (EMN) beim Bundesamt für Migration und Flüchtlinge (BAMF), EMN/BAMF, 2012. Other recent publications include “(K)eine postkoloniale Entwicklungsökonomie in Sicht?”, in ibid., Jessica Breidbach, Abdel Amine Mohammed, David Schommer and Katja Voss (eds. ), AfrikaBilder im Wandel?, Peter Lang, 2011; and, as co-author with Korbinian Hartberger, “Entwicklung” ent-wickeln. Weltbild, Hierarchie und Differenz im Alltagsgebrauch von “Entwicklung”, Habari 3 (2011): 30-6. 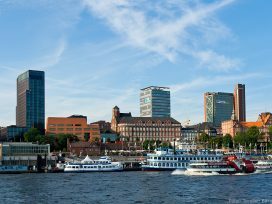 Hamburg is one of the principle harbour cities in Europe and probably the most powerful in economic terms. Situated about 80 kilometres from the coast, the city was once part of the “Hanse”, or Hanseatic League – a powerful confederation of the shipping and trading cities within German territory. Hamburg developed from a free and independent, sovereign state into what is today: Germany’s second largest city. This article is based on a harbour tour held 15 September 2012 as part of Eurozine’s 24th European Meeting of Cultural Journals in Hamburg.